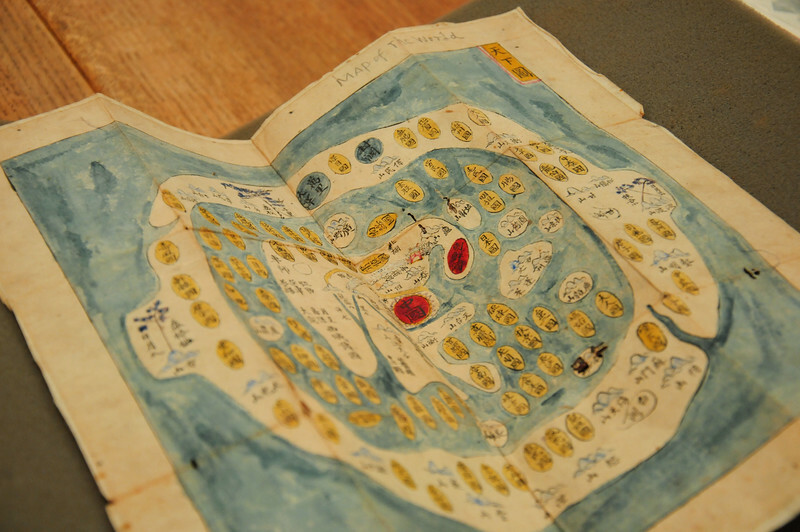 Madeleine C. Taylor-McGrane '19 Photo 1: A 16th Century Japanese Map of the World housed in the Harvard Map Collection in the Pusey Library. Photo 2: A 19th Century replica of an 18th Century promotional map of New England. It is housed in the Harvard Map Collection in the Pusey Library. Photo 3: A map of Britain housed in the Harvard Map Collection in the Pusey Library. Photo 4:David Weimer, librarian for Cartographic Collections and Learning at the Harvard Map Collection, displays a world map held in Pusey Library. Photo 5: A ribbon map of the Mississippi River housed in the Harvard Map Collection in the Pusey Library. Photo 6: A map depicting the Mexican-American War, featuring important figures in the war, housed in the Harvard Map Collection in the Pusey Library. Photo 7: Stores of wall maps held in the Harvard Map Collection in the Pusey Library.